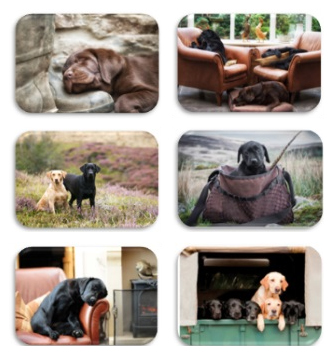 Presented in a beautiful box, embossed in gold foil these placemats by Country Matters show a selection of high quality pictures of labradors. Measuring 33x 23 cms these placemats are wipe clean and heat resistant to 90 C. They would make an ideal gift for labrador lovers. Many of the photograpghs are by Villager Jim and feature black, yellow and chocolate labradors as well as labrador puppies.